1 pc. 43,33 EUR ea. from 3 pcs. 38,47 EUR ea. from 10 pcs. 34,13 EUR ea. Ask for a rebate from 20 pcs. We call this magnet with reverence THE DEATH MAGNET. I have no idea what you could reasonably do with this magnet - it is simply too intense for most applications. Monitors, credit cards, video tapes - all down the drain. Tip: Always put a thick piece of cardboard underneath before attaching it to a metal surface, so you can slide it off sideways. Otherwise, you'll never be able to get it off again. And if you have two of these together, not even Schwarzenegger will be able to separate them without any tools. My advice: Buy a smaller magnet! But if you think you really need this monster (like more than 120 000 people before you): BE CAREFUL!!! And please never, never allow children to play with DEATH MAGNETS. 1 pc. 83,84 EUR ea. 1 pc. 68,05 EUR ea. 1 pc. 82,30 EUR ea. 1 pc. 29,99 EUR ea. 1 pc. 374,85 EUR ea. 1 pc. 21,58 EUR ea. 1 pc. 23,46 EUR ea. The DEATH MAGNET plays an important role in our video "The Power of Magnets": "We call it 'DEATH MAGNET' because of its supernatural and almost demonic strength"
I recently asked a customer what he wanted to do with his magnets. It looks totally harmless just laying there... THE DEATH MAGNET... ready for an experiment. The metal plate is sanded smooth so that the magnet will hold optimally. The magnet on a steel plate. The surface of the crossbeam is sanded smooth so that the magnet can hold even better. Ideally equipped for the handling of large super magnets: protective glasses and gloves! It's just about to go "Klonk!!!" 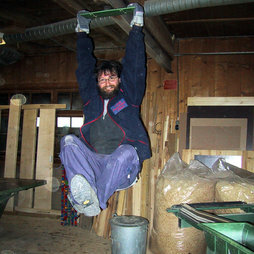 Carpenter Beat hanging from a crossbeam, held up only by a "DEATH MAGNET". One moment of not paying attention ... and "whack!" Customer Christian Hoffmann celebrated last Christmas with a magnet tree: "Here are a few photos with a Q-51-51-25-N and 55 K-06-C that are appropriate for the season. ;-)"
Now you can clean without getting your hands dirty or wet!